Mark your calendar for IACEE 2016 and participate! 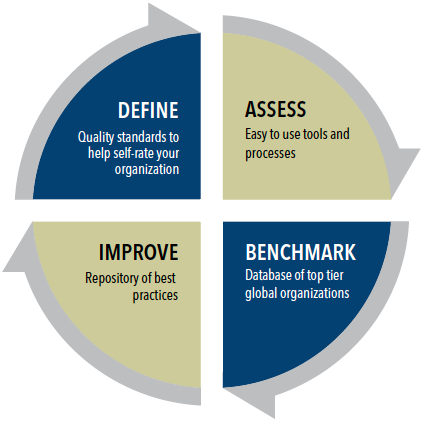 IACEE Quality Program -- Take a Moment Today to Benchmark and Improve Operations and Programs! Universities and Business: Can They Work Together To Bring Economic And Social Changes? 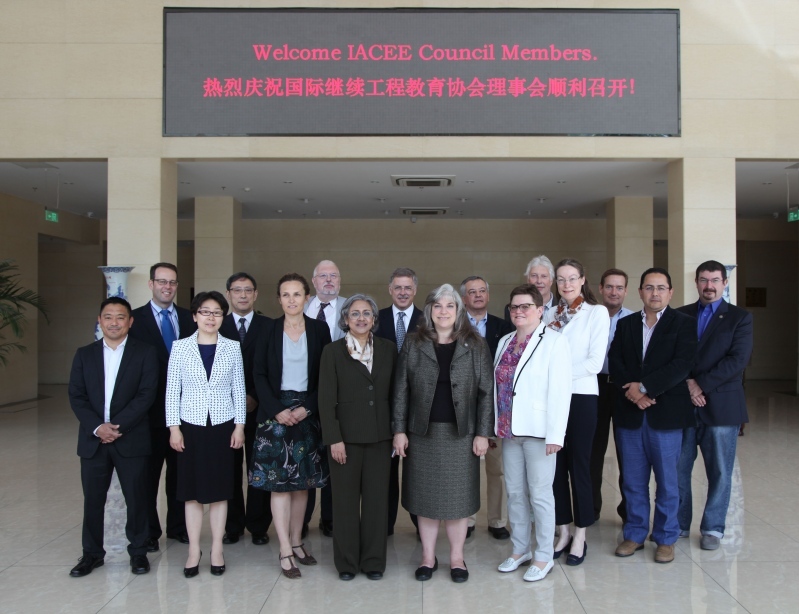 The IACEE Council held its summer meeting in Beijing on May 13th at the headquarters for the China Association for Continuing Engineering Education (CACEE). Council members from 10 countries attended the meeting to discuss relevant issues of global development of continuing engineering education in schools and enterprises. At that meeting, updates were provided on plans for the 2016 IACEE World Conference, the IACEE Quality Program, and IACEE’s CEE Manager Training Program. The vacant position on the Executive Committee was also filled with the election of Ricardo Gutierrez-Mercado from ITESM - Tecnológico de Monterrey to the position of Vice President for Products. Welcome, Ricardo to the Executive Committee! Other discussions centered around updates planned for the website, a webinar series for the 2015-2016 academic year, activities of the Special Interest Groups (SIGs), the next solicitation for IACEE awards, and regional events at which IACEE will have a presence in the coming year. The Council also approved the formation of a Think Tank concept where members and non-members can gather to discuss significant ideas, put forth ideas and actions that are meaningful for bringing about continuing engineering education. More information will be forthcoming soon. Look for ongoing updates and information about all of this and more on the IACEE website. 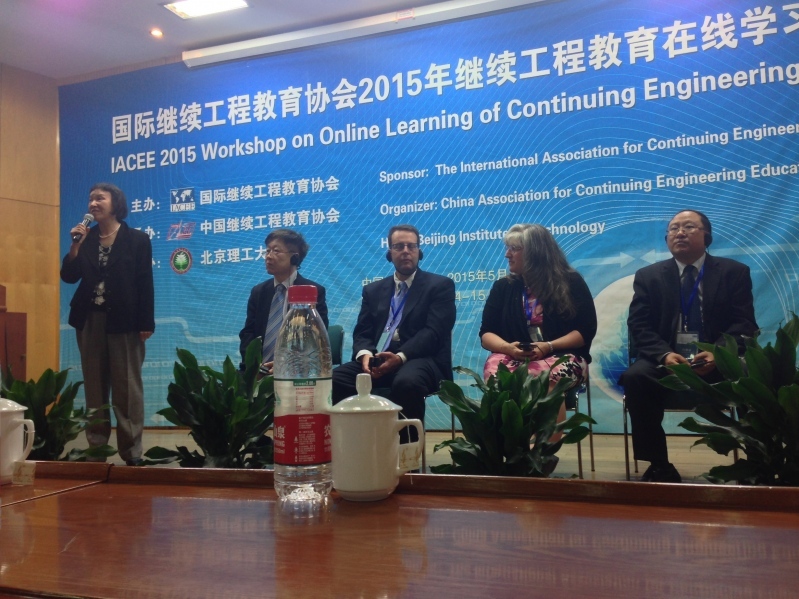 Following the Council Meeting, IACEE Council members joined IACEE and CACEE members from industry, government, and academic institutions in China for a Workshop on Online Learning of Continuing Engineering Education on May 14th and 15th at the Beijing Institute of Technology. The workshop featured keynote speeches from Nelson Baker, IACEE Secretary General and Past President, and Dean of Professional Education at Georgia Institute of Technology, and from Mr. Sun Jianli, Director General, Department of Professional and Technical Personnel Management, Ministry of Human Resources and Social Security. Presentations were also made by several IACEE Council members and leaders within China on topics ranging from the expanded use of the internet for online learning to technical professionals in China, issues around quality assurance for online learning, scaling online learning to meet workforce development needs, and innovations in online learning. Throughout the workshop, there was a great exchange of ideas on how the global CEE community can work together to improve and expand online learning in CEE. There were about 60 participants from relevant government departments, commissions, associations, large state owned enterprises and universities. The three sessions featured Current Situation and Practice of On-line Learning of CEE; Issues, Options and Challenges of On-line Learning of CEE; and Future Development Vision of On-line Learning of CEE. For each session two presentations from IACEE members and two presentations from CACEE members exchanged their experiences and proposed ideas for improvement. IACEE 2016 is the 15th World Conference of International Association of Continuing Engineering Education. It will be held in Porto, Portugal on 17-20 May 2016. The theme is Innovation in Continuing Professional Development: A Vision of the Future. The three tracks are: Ensuring CPD University-Industry-Business Alliances, Envisioning CPD Future Modes, and Devising CPD Stakeholders Alliances. Organized by engineering organizations, this international event will be the place to discuss the current state and best practices of continuing professional development (CPD), and foresee its future. Major stakeholders are invited and interaction is sought to write the history of the future of CPD. The format of the conference will provide plenty of occasions to hear everyone´s opinion and exchange ideas and plans. We invite you to take part in shaping the future of CPD on a global stage with one of the very few international organizations that is devoted to CPD. Take advantage of the conference to visit Porto, a city that has been chosen as #1 best destination in Europe in 2014. Visit the conference website and follow the developments at www.iacee2016.com. IACEE Institutional members can now use a quick and easy way to see how we are doing in key areas of strategy and operations, AND compare and learn from other outstanding organizations. Just visit the IACEE Quality Program web site and complete the brief survey with current information. Take a few minutes to do this today, and take another step toward the critical self-evaluation and benchmarking that is essential to great management and continuous improvement! 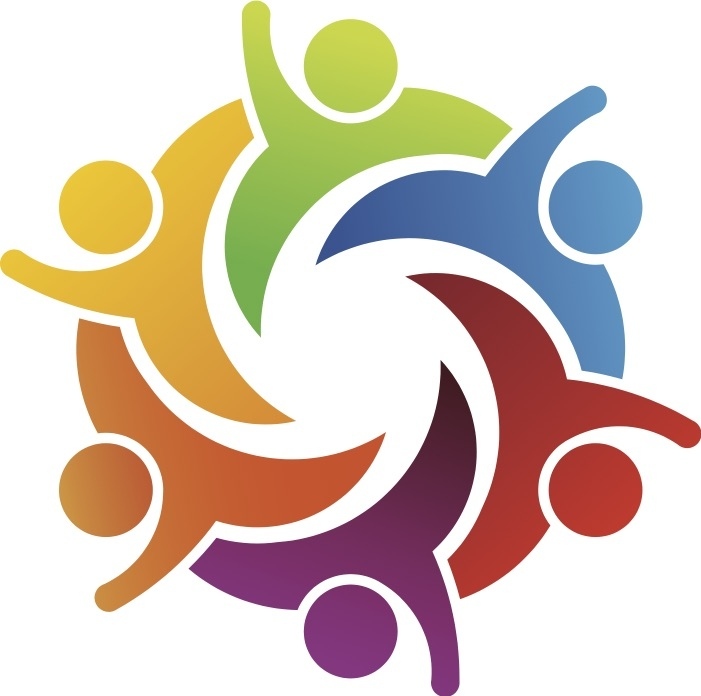 This all starts with you, but it continues and builds momentum as you engage others in your organization in responding and sharing with your peers in IACEE. And the progress continues as you learn more about others who have mastered aspects of operations and strategy where you want to improve. This is your first step toward accessing greater detailed benchmarking information about specific aspects of some of the best run professional and continuing education organizations in the world. Join or redouble your progress toward excellence by entering your current information today! Click here to view all previous KSMs which provide tips on various areas of interest to CEE operations. As an IACEE member, do you have a special tip you would like to share with others to help us perform our jobs more efficiently or effectively? If so, please contact Council Member Pat Hall at patricia-hall@utulsa.edu. Remember: Four badges will earn you a certificate. Rethinking and opening up education: new and innovative approaches for delivering education more suitable to prepare graduates for the job market and to continuing education, upgrading and re-qualification of employees. Business creation and employability: quality education and entrepreneurial skills boost growth and competitiveness and we have to define which transversal skills can be taught in cooperation with enterprises to strengthen employability, creativity and new professional paths. Strategic alliances and the creation of ecosystems: the role of the public sector, of enterprises and universities in the implementation of local smart specialization strategies for a greater impact on regional development.